On June 24th 2015, I had the strangest experiences of my life. It was evening and I was standing in my recently remodeled bathroom. The halogen lights over the adjacent vanity area were dimmed to their lowest setting and the bathroom lights were off. I was standing near the doorway but behind the wall so that I could not see the vanity counter and light switch – just the dim light coming into the bathroom. As I was inwardly conversing with True Papa (the one-and-only true source), I noticed the reflected vanity light get brighter, as if someone slid the dimmer switch up half way. I thought maybe a person had entered my apartment without me knowing it or maybe one of my cats (not likely at all) had somehow managed to get a claw on the small raised dimmer slider, but as I stepped to the left to look out the doorway, there was nobody in the hallway and no cats on the counter. Not detecting any shimmer or evidence of anything with my eyes, I was shown the image in my mind. 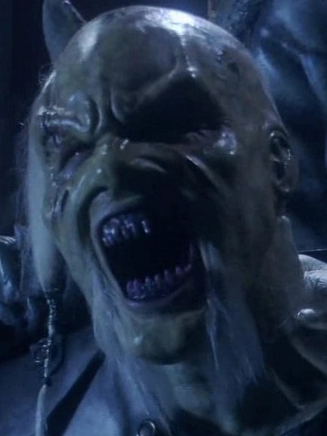 Imagine one of those vampire/ghost twins from that Matrix movie, with the white-hair-dreadlock looks but with a very evil-looking face, more like the face of the wraith king* from the Stargate SG1 TV series (essay image). I was just to its direct right about four feet away. It was looking forward and up at a slight angle, but it had not detected me yet. Assuming it worked since I didn’t see it in my mind anymore, I had the idea to check the dimmer switch to see if it had been physically moved up. As I started through the doorway, I heard a whooshing sound and what felt like a vortex spinning around my torso and I was physically pulled back about a foot to just inside the bathroom. Completely shocked at what had just happened, I heard in my mind, “That thing came right at you,” and the instant-replay image showed in my mind: When I broke the plane of the bathroom doorway, that creature finally noticed, turned toward me and then rushed right at me. True Papa pulled me back and the wraith slammed into his true spirit shielding the doorway and the wraith was instantly annihilated. I actually flinched backward during the replay in my mind as that grotesque snarling face disappeared a few inches from my face. Before I could even ask as to why the binding and casting didn’t work, I received the instant message that this particular entity was incarnated in a human body, so technically, it was astral-projecting itself while still connected to its body. Evil can only be overcome by that binding-casting method if it is not incarnated. When I tried to bind it, it sensed that attempt and phased itself just out of “view” of my subconscious. Eventual information indicated that this entity was an assassin that attacks a person’s subconscious mind to the point where most of its victims eventually die – usually under mysterious circumstances. When its spirit form was annihilated, its physical body was ruled comatose and it died a few days later. Supposedly, even though I was thoroughly protected, True Papa used me as a lure to get this thing to unknowingly touch the annihilating aspect of his true spirit. He also did it to prove to me his existence and to give an indication as to the upcoming demise of the evil elite and their goons. * ex-Wraith image fair-use compliant.